I love that someone looked at this and knew something wasn’t right and tried to make it better. 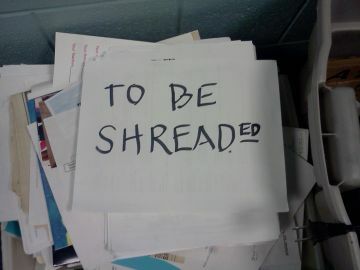 Okay here’s the deal: When you have a box full of papers to shred, they are to be shredded. Not shread, and certainly not shreaded. Nice try, though. At my office we nearly had a disaster when some temps thought the boxes in our store room labelled “SRED” were to be shredded – it was actually boxes of SR & ED paperwork (for Scientific Research and Experimental Development tax credits). Fortunately they were caught before anything was destroyed.